"This book snatched my heart out of my chest, threw it on the floor, then scooped it up and made it a cup of tea. Olivarez explores all the contradictions, pain, and joy of being the son of Mexican immigrants, as he tries to find his place in this so-called American Dream. Every poem is a masterpiece, truly. I cried, laughed, gasped, and went "oh f*ck" out loud, all on public transportation. Get. This. Book." Section Poetry / All Staff Suggestions / Fiction Suggestions / Kaleigh O. 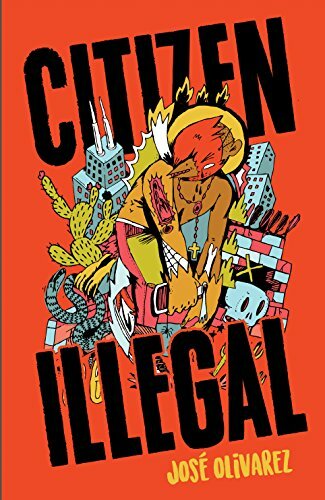 “Citizen Illegal is right on time, bringing both empathy and searing critique to the fore as a nation debates the very humanity of the people who built it.” ?Eve Ewing, author of Electric Arches In this stunning debut, poet José Olivarez explores the stories, contradictions, joys, and sorrows that embody life in the spaces between Mexico and America. He paints vivid portraits of good kids, bad kids, families clinging to hope, life after the steel mills, gentrifying barrios, and everything in between. Drawing on the rich traditions of Latinx and Chicago writers like Sandra Cisneros and Gwendolyn Brooks, Olivarez creates a home out of life in the in-between. Combining wry humor with potent emotional force, Olivarez takes on complex issues of race, ethnicity, gender, class, and immigration using an everyday language that invites the reader in. Olivarez has a unique voice that makes him a poet to watch. José Olivarez is the son of Mexican immigrants. He is a co-host of the podcast, The Poetry Gods. A winner of fellowships from Poets House, The Bronx Council On The Arts, The Poetry Foundation, and The Conversation Literary Festival, his work has been published in The BreakBeat Poets and elsewhere. He is the Marketing Manager at Young Chicago Authors.